"Coaching is the best gift I have every given myself. Not only has my career moved forward but what I learned about myself and the connection I made to my spirit surpassed my wildest expectations. What's even better is that the lessons I learned are still with me 3 years later!" 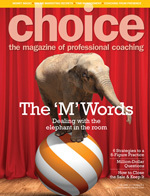 "I took Power-Coaching because I wanted to become more happy in my work. Power-Coaching taught me techniques for using creativity and intuition to find my own solutions to situations which were making me unhappy in my work life. I was dwelling too much on the negative, and Power-Coaching helped me to see a more balanced view of the things that affected my work life. The best thing about Power-Coaching is that I can use these new skills to help me through any other situation that I might encounter in the future. They are skills for life. Mike Bonkowski, CA. Meyers Norris Penny. Cathy McLellan is a Senior Advsisor in MNP's working with the firm's Human Capital team, specializing in organizational development. Cathy has extensive experience in training and process facilitation, executive coaching, leadership development, career management, change management, and human resources and organizational development. Cathy takes pride in assisting individuals and teams with the establishment of internal cultures that bring out the best in employees, which ultimately helps the organization to excel. She facilitates internal processes to create workplaces that promote the engagement of individuals, teams and whole organizations. Cathy helps organizations work more effectively through enhancing self-awareness and developing the skills required for personal and professional success. She teaches others to recognize the strengths within themselves and their organization and helps them create their own solutions that facilitate growth and development. With over 20 years of experience, Cathy uses proven techniques to help others enhance employee relationships, build teams, improve internal communications and increase employee satisfaction and retention. Cathy has worked as a certified coach for the past ten years and has worked with a diverse range of clients from CEO's, directors, to artists and self employed individuals. She utilizes a combination of tools and resources specifically designed to assist each unique individual with their unique goals, challenges and aspirations. She has experience in all levels of government, the private and not for profit sectors. Cathy is certified to work with internal teams and to develop coaching skills within an organization. She is experienced in developing a customized program for organizations that involve a combination of assessments, coaching, coach training, mentoring programs and teambuilding. Cathy is passionate about helping individuals, teams and whole organizations reach their potential!